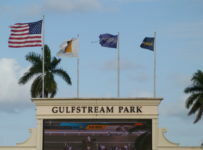 Gulfstream Park is entering the final three days of its summer meet, with racing this Thursday through Saturday. 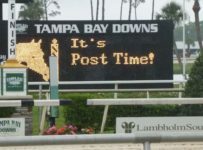 First post is 1:15 p.m. for Thursday’s eleven-race card. 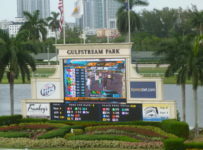 The main track is listed as fast and the turf course is listed as firm. 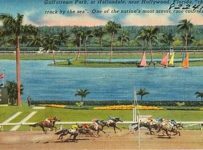 The Weather Channel forecast is for just a 15 percent chance of rain during racing hours in Hallandale Beach, where Gulfstream is located. 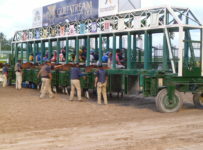 On Thursday’s first race, there is an overnight carryover (from Sunday) of $1,807.69 on the Super Hi-5 which requires picking the first five finishers in correct order. The carryover on the Rainbow 6 is $89,560. It is on races six through eleven. 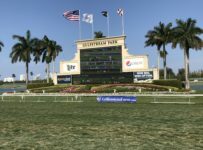 The featured fifth race is an allowance/optional claimer at 7 ½ furlongs on turf for Florida-bred fillies and mares three-years-old and up. The purse is $37,000 and the optional claiming price is $12,500. None of the eight entrants are in for a tag. We will have coverage this afternoon on our blog. 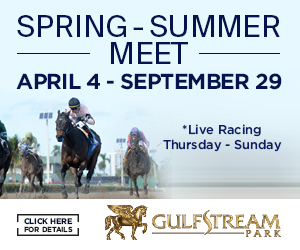 On Friday, Gulfstream has an 11-race card with first post at 1:15 p.m.
Saturday is closing day for the 2016 summer meet. 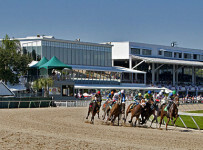 The Saturday card has 13 races, with first post at 12:00 p.m. 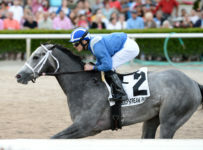 The card will have eight stakes races, including the third and final legs of each of the four divisions of the Florida Sire Stakes. We will have previews of those races starting Thursday evening, and on-site coverage on Saturday. 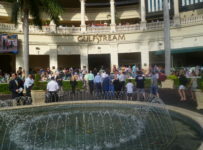 On Saturday for all exotic bets, Gulfstream will have mandatory payouts of the day’s pool (minus takeout) and the entirety of any carryovers. That includes the Rainbow 6, the Late Pick 5 and the rolling Super Hi-5. 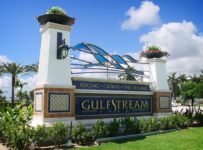 Gulfstream on Saturday will pay out the Rainbow 6 jackpot even if there are multiple tickets with all six winners. The jackpot consists of the entire carryover plus 80 percent of the day’s bets on the Rainbow 6. The takeout is 20 percent of the day’s bet. 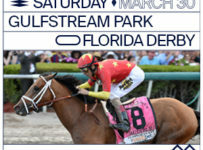 On non-mandatory days, Gulfstream pays out the jackpot only if there is just one ticket with the winners of all six Rainbow 6 races. Especially if there is no single-ticket jackpot winner on Thursday or Friday, it is likely that $1 million or more will be bet on the Rainbow 6 on Saturday. 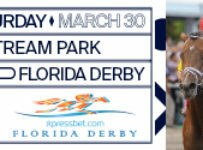 That day’s pool and carryover will be divided equally among tickets with all six winners. 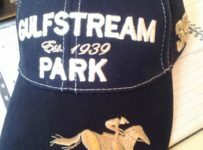 On non-mandatory payout days when there are multiple Rainbow 6 winning tickets, Gulfstream takes out 20 percent and then divides 56 percent of the day’s bet among the multiple winners while adding 24 percent to the carryover. 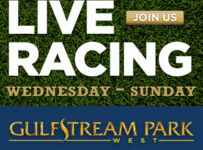 The Gulfstream Park West meet, held at Calder, will open on Wednesday Oct. 5. There will be a new pool on the Rainbow 6.